Not much knitting content. Or at least no pretty pictures. Although I had swatched for Shiraz, the swatch lied. Once I got past the yoke, into the part with swaths of stockinette, I checked my gauge, and it was off, both for stitches and rows. I'm sure part of the problem can be blamed on the fact that I was using Addy Turbos. I really don't like their stubby, stubby tips, but I figured this would be a good project for them. Plus, they were the only size 7s with a long enough cord that I had free. But the slickness of Addys combined with my naturally loose knitting to make it even looser. I also decided that I was making a size too large. I frogged the whole thing and cast on again on size 6s and a smaller size. When I was about 10 rows in, I realized I was 4 stitches short on one of the fronts, so I ripped back about 6 rows. I'm now about 12 rows in and things seem to be going better, but it looks pretty much the same as it did in my last post! Looks familiar, doesn't it? I never know what to call this color, but it's my favorite shade of pink. Make it just a little more red, and it becomes cherry. 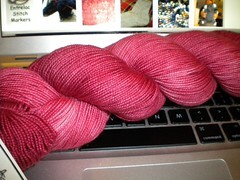 I have lots of yarn in my stash that's about this color. And here's something unrelated to knitting. 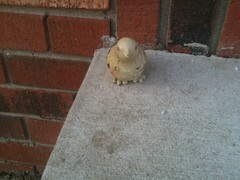 Last Tuesday, I came home from work and found this little bird sitting on my stoop. His back was to me, and he looked like he had just hopped up on the step. I had to look more than once to convince myself he wasn't real! He seems to be made of wood, and the end of his tail is broken off. I have no idea where he came from, but I suspect that one of the many kids in my neighborhood found him and left him on my doorstep. So I moved him back closer to the house, in a safer place, where he can watch the world go by. Ha ha! I thought that was a real bird too! I like those socks to be. I think that color will go well w/that pattern. i always admire the stick-to-it-iveness that knitters show when there are multiple froggings of sweaters. i've had to do it too, and although it becomes crazy frustrating, isn't it amazing that we do it anyway? and i LOVE that shade of pink. in the photo anyway, it looks like double bubble. Definitely your shade of pink. I have not idea what to call it, though. How about Janna Pink? Cute bird, too, although his feel look unusally large! That could totally be Janna Pink! Great idea Steven. love the shade of pink...the bird will be your lookout! Oh swatches lie lie lie. Even when they are big and done on the same needles. I don't tell my Beginning Knitters this right out, though. It might discourage them. That is definitely Janna Pink - perfect name for that shade!